Aclose relative of Albertosaurus, king of the tyrant lizards Tyrannosaurus rex was one of the amazing dinosaurs to ever live. The largest known meat eater, it was more than 12 metres (37 ft) long and stood almost as tall as a giraffe. Unlike a giraffe, however, Tyrannosaurus rex was massive and powerful. Its skull in particular was an imposing unit of bone. Up to 60 teeth, some of them longer than a human hand, lined its jaws. If humans had been around, they could have slid down its gullet with ease. Its eyes faced forward, providing better depth perception, important for a predatory animal, and its narrowed snout gave it a clear field of vision. At the other end, a heavy tail counterbalanced the skull. A complete tail has never been found, so no one knows exactly how long it might have grown. 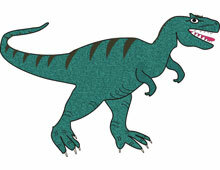 Tyrannosaurus rex is one of the most famous of the extinct reptiles.